When Consuelo Castiglioni announced she was stepping down from the brand she founded, Marni, shockwaves reverberated around the industry. The brand which prided itself on intellectualising fashion with its experimentalist perspective saw the exiting of Castiglioni, her husband and cofounder Gianni Castiglioni and their two children in an unexpected turn of events. To replace Consuelo, Renzo Rosso appointed Prada-trained Francesco Risso who made his debut in the menswear season fall 2017, in January at Milan Fashion Week. His debut was satisfactory, albeit pastiche—his over-reliance on his previous employer’s aesthetic was visible; this is especially problematic given the implicit competition between the artistry of the two Milanese brands. Transversely, Risso’s Marni was geared towards a younger consumer. Castiglioni was preoccupied with spotlighting the necessity for individuality for her women. Risso’s reconfiguration is a tricky one, based on business obligations rather than creative propositions. This, perhaps, is where the complications arise. It is a poisoned chalice, empathy is advised. Replacing a storied, much-loved fashion designer at a storied house is no small feat. There is a bounty out on Risso’s creativity. There is industry-wide scepticism and bitterness and the current creative director is faced with the runt of that. Critics search for opportunities to dismantle his aesthetic, highlight and castigate minor faults. It’s unfair but characteristic of the fashion industry. These things take time and Risso deserves a chance to prove himself, even if it is difficult to watch in parts. His Spring 2018 menswear show was another cityscape exploration. One presumed it was the end of the day, the styling was insistent on insouciant charm, with untucked shirts and wrinkled jackets. Shirts were unbuttoned and ties were loosened, the Marni man was homeward bound. Risso shed the rigidity in tailoring that Castiglioni favoured. Here, the man was influenced by casual tendencies—the recurring motif in spring 2018 collections, the mergence between casual clothing and workwear. There were the usual Marni idiosyncrasies, shown in odd, slightly unappealing colours. A blue and green striped suit were typical of the Marni aesthetic—the emphasis on something perverse, ugly. 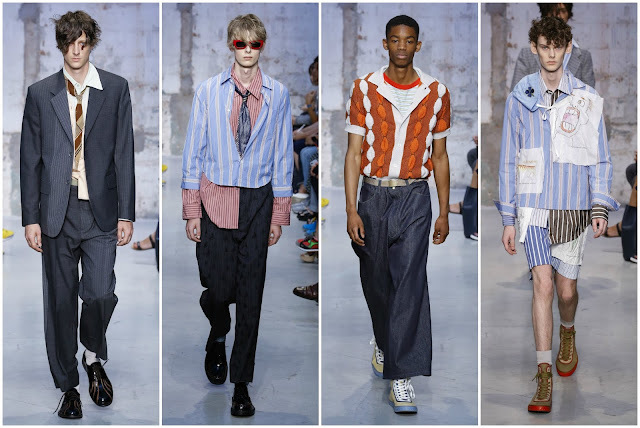 He endeavoured to bring more originality to this collection but there were still notions of recent Prada collections—and Thom Browne too, with the swimwear-inspired pieces. One couldn’t help but register the meretricious nature of the clothing. They were decidedly shallow and Marni has never been thus. Perhaps he needs to pay greater attention to the brand codes: “irreverent and emotional.” He has the irreverence down but what is irreverence if it doesn’t have emotion?